I have decided on my first movie to see and blog about for the 2011 film festival, and again I find myself picking a movie by the photo in the online booklet. In 2004 I picked a movie to see from a photo ad for the movie 'DIG!' directed by Ondi Timoner and that movie changed my life. I may not have that expectation here, nor did I have it then however. I will keep you posted on this adventure. Well the images, filmed in black and white on a out of production Kodak film stock gave this film another wordily feel, time and space, a calm controlled palate to introduce other forms of colour film. This was used in a way so that at times my mind did not know if I was looking at colour or black and white and it did not mater. I watched this film the way I would watch a butterfly in my yard. The trails through East Anglia, mapped are based on the walks in W.G Sebald (The Rings Of Saturn). It is not a story based on a book but a story about the book. 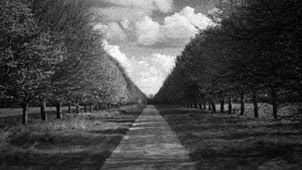 The slow deliberate pace of the movie contrasted with the fast passed walking colour footage taken by the director Grant Gee of his feet walking. This colour footage centred in the movie from time to time, was not jarring but more a tap on the shoulder to wake you from a dream of landscapes and places. There are secret, and sacred places, and this movie lets us travel there with no feeling we would be hurt or shocked. All is calm, a treat to the eyes and our busy lives. Yes it would have been nice to have read the book that he is travelling through, but the journey is wonderful, the book will be next. I will look at my photos of East Anglia and if any of my black and white photos have the feel, I will add them to this review. You might be thinking were might the music connection be, has bev given in to her photography. The director Grant Gee has made two previous impressionistic documentaries, such as Radiohead's "Meeting People is Easy" and his 2007 documentary, Joy Division.